The fan nozzle is designed with a large number of jetting nozzle heads, and these jetting heads are equipped on the same water distributor. So its water pattern seems like a fan or peacock that has spread out its tail. It is capable of being installed both vertically and obliquely. 1.The fan nozzle can generate fan-shaped water stream with strong impact force. 2.Its spray angle ranges from 0 to 100 degree. 3.Its water spray is quite even. 4.When using this kind of nozzle unit, users only have to replace these fan nozzles instead of the whole nozzle part, which dramatically reduce the replacement costs. Established in 1984, Guangzhou Water Art Fountain Irrigation Garden Co., Ltd is a professional manufacturer of fan nozzle in China. In addition to fan nozzle, we still provide customers worldwide with music fountain, programmed animated fountain, garden fountain, square fountain, scenic fountain, artificial fog fountain (mist fountain), laser fountain, waterfall rockery, sculpture fountain, floating fountain, running fountain, wall fountain, waterfall feature, digital water curtain, creek water feature, indoor water fountain, outdoor water fountain, morning glory nozzle, flower fountain jet, dandelion fountain nozzle, rotary nozzle, flat nozzle, fog nozzle, adjustable nozzle, water sphere and hemisphere nozzle, aerated nozzle, spring nozzle, etc. We have built water features for Spring Festival Evening Gala of China, China Art Festival, and many other Chinese literature and art activities. And so far, we have set up long-term cooperation relationship with customers around the world, such as Malaysia, Brunei, Tajikistan, Saudi Arabia, UAE (United Arab Emirates), and many other countries in Central Asia and Southeast Asia. 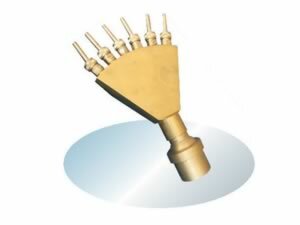 If you're interested in our fan nozzle, please contact us freely. Adjustable Nozzle The adjustable nozzle can jet water in crystal column, and this water column is formed by cylindrical hollow water film. Its section is a gap ring. Its water stream is strong and magnificent. And its anti-wind capacity is quite strong. Water Sphere & Hemisphere Nozzle The water sphere and hemisphere nozzle is a kind of porous diffusion nozzle, and its water patterns seem like discharging fireworks. Its apperance is attractive and it is convenient to install. And it is suitable for a wide variety of fountains.